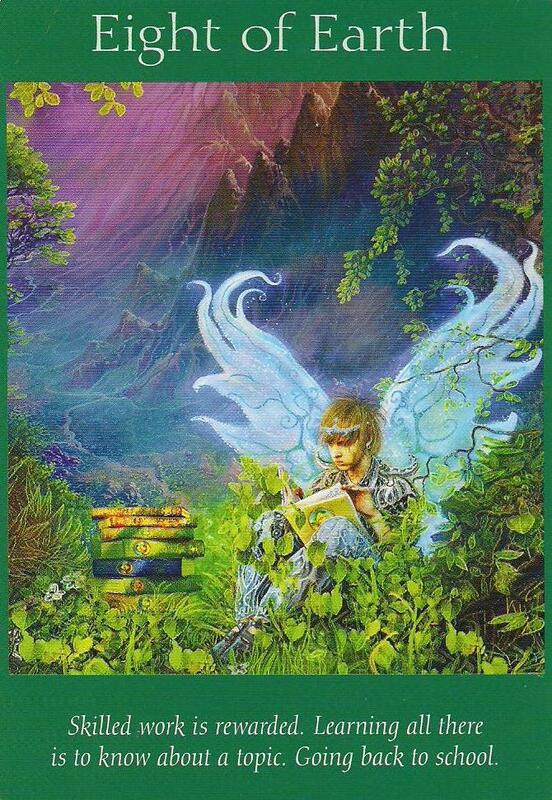 Weekly Card Reading: June 9-15, 2014 – Wish Upon a Star! What a lovely week we have ahead! Our soul searching and the work that we have been doing to release toxic relationships and cultivate those that uplift us is paying off. We enter the week with the Queen of Water card. Our relationships are deepening and we are feeling closer and more authentically intimate with those around us. We are connecting in a heart-to-heart manner and are feeling much more intuitive and empathetic. This is a time for us to really hone in on our intuition and to honor what we are feeling, but we must also be sure to care for ourselves. As our empathy increases, we may feel more drawn to nurture others and to help them with their feelings. Remember that self-care must come first. You are of no help to others if you are coming from a place of depletion. Honor your body, honor your heart, and listen to your soul; be as or more compassionate with yourself as you are with others. Mid-week we see The Star. This is the time to make a wish for your future! Things are looking good. You have laid the ground work and now you can make your long term plans. 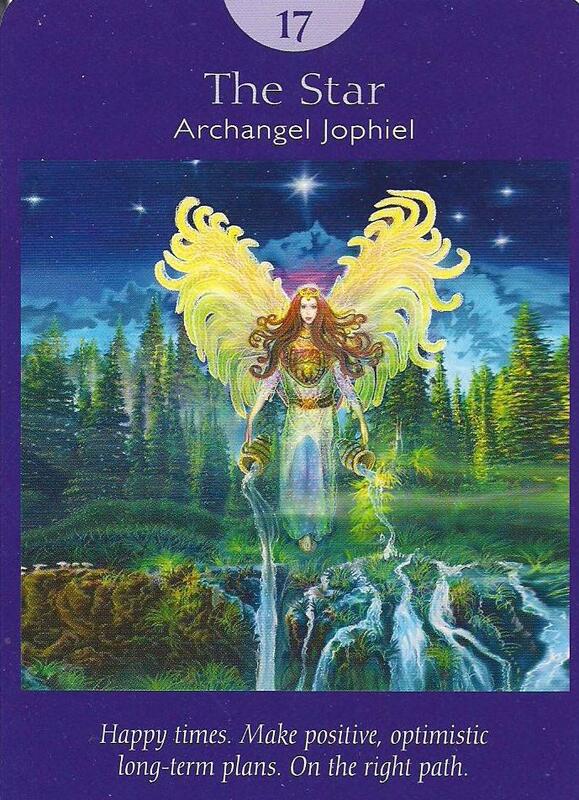 Archangel Jophiel is the angel of beauty, and she is coming through to remind you of the splendor and abundance that is all around you. She pours two cups of water that spring from an endless supply – know that your potential is unlimited! What is it that you dream of? Ask, believe, and you shall indeed receive. 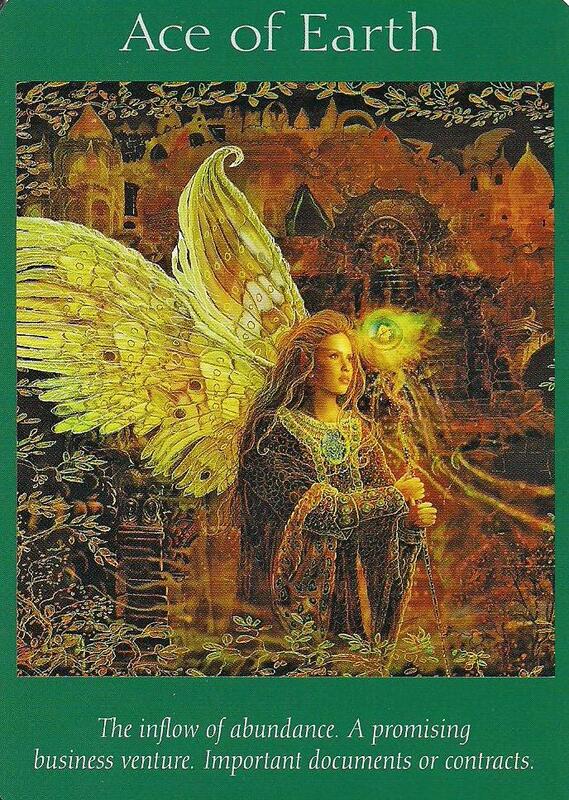 This card is also a sign that you are on track with your soul purpose. The star guides you and shows that you are in alignment with your higher purpose and the Divine. 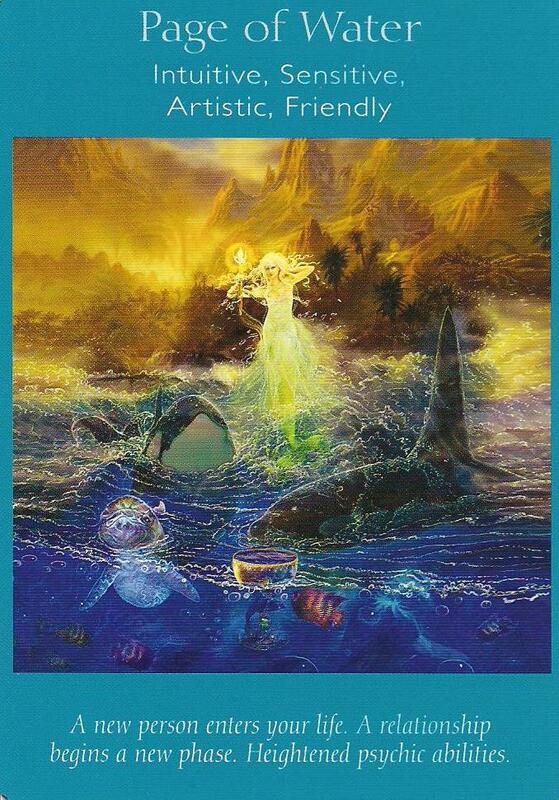 We actually have two signals this week that this is the case as the presence of Whale in the Queen of Water card also symbolizes alignment with our divine path. 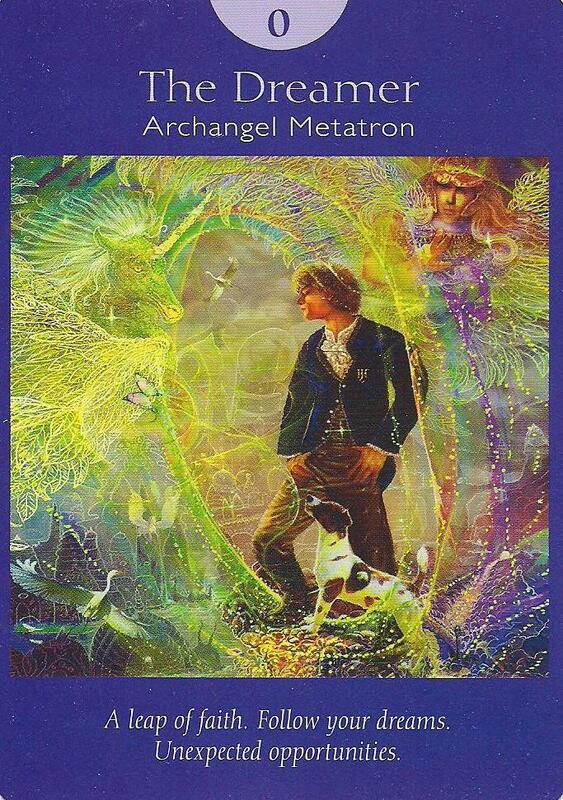 If for some reason you feel lost, this is the time to focus on finding your passion as the energies are in strong positioning and support for it. Take time to check in with those around you and yourself to begin the process. 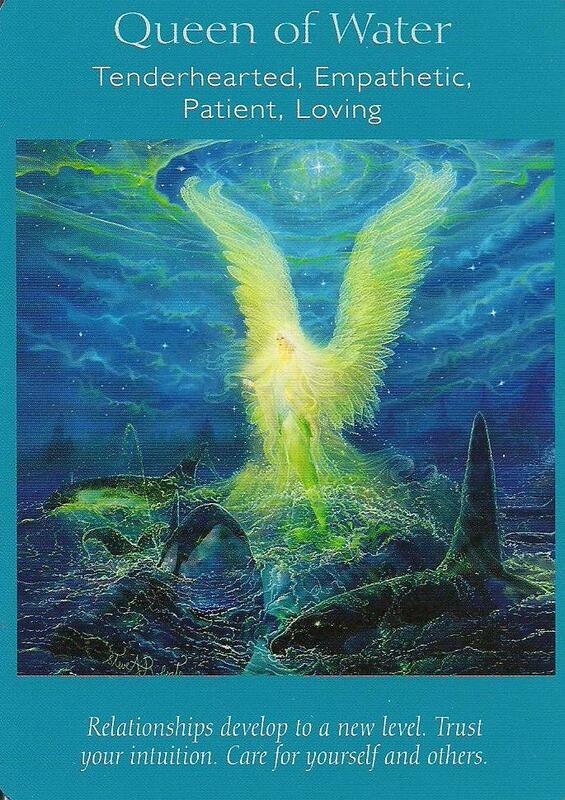 The Star card also signifies a time of heightened intuition – the answers you are seeking can be revealed if you create the space to meditate and reflect – approach the task with curiosity and wonder and be open to receive; your guides are eager to share with you! We finish the week with Knight of Air. We have been experiencing heightened intuition and now we have the opportunity to marry that with the intellect. Remember that it does not need to be one or the other; both can co-exist and in doing so can aid in the earthly manifestation of ideas from the higher realms. 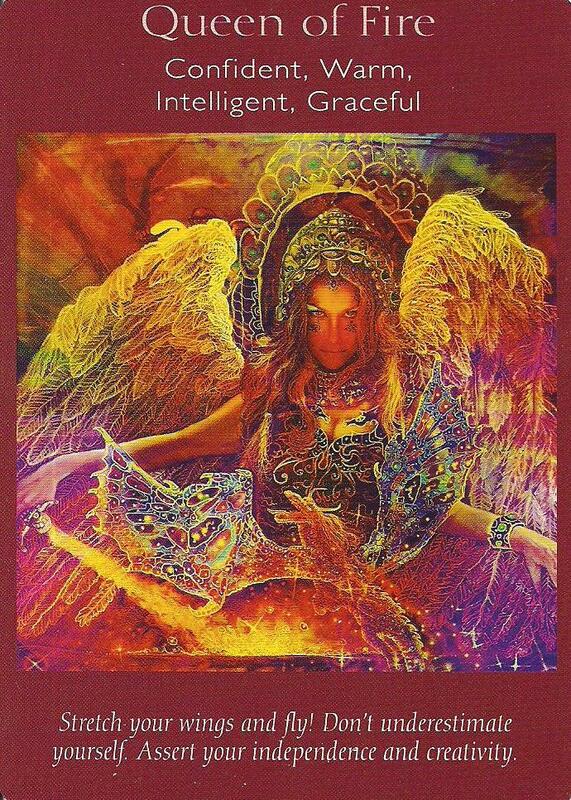 Things are entering hyper-drive, so make sure that you stay grounded (so much time in the intuitive realm and the higher chakras may have you feeling spacey so focus on connecting to the earth), and that you are prepared for a lot of rapid change. Creative solutions will be flowing to you and a sense of groundedness will allow you to put them into action quickly and effectively. The glowing light of the unicorn’s horn also feels like a star to me – your path is illuminated and you are heading in the right direction. Stay on course and enjoy the ride! Categories: Uncategorized | Tags: Angel Tarot, Certified Angel Card Reader, Doreen Virtue, Knight of Air card, psychic readings, Queen of Water card, Radleigh Valentine, Tarot card reading, The Star card, weekly card reading | Permalink. 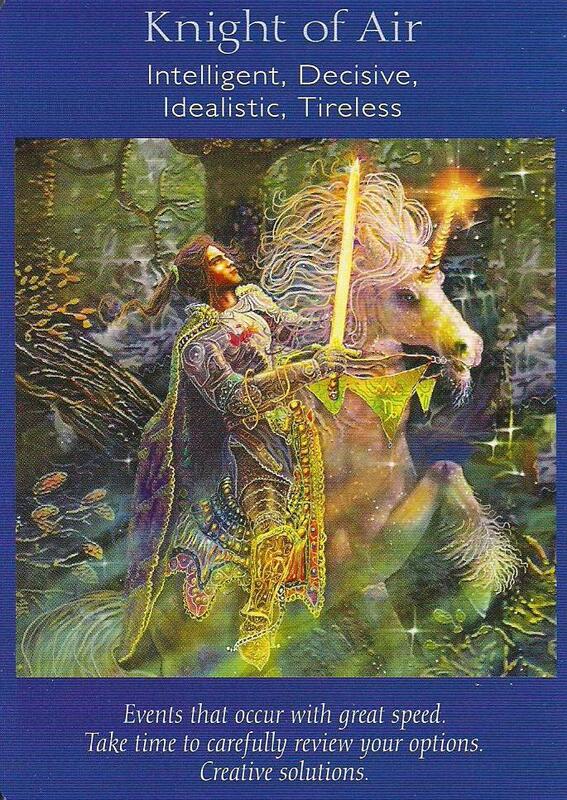 Weekly Card Reading: April 7-13, 2014 – Charge On! We enter the week with a little internal strife. The Five of Air card shows us that things aren’t looking just like you want them to and it’s time to evaluate the situation and make some changes. Remember that your power resides in how you handle the situation moving forward. Take some time to review what has happened and what is going on so that you can make a healthy and empowered choice with respect to it. Note what you have learned, as this is the silver lining for your path moving forward. Nothing occurs in vain if you don’t allow it to. It’s a time to review everyone’s motives in the situation as well, including your own. Be sure that you are acting within your integrity so that you can clear away any anxiety, concern, or fear that may be motivating your actions. The more that you act from a place of genuine desire and love, the greater your experience will be and the more fulfilling the rewards. Now that you have made the necessary adjustments to your situation, you can begin to clear away the debris. Rest assured that once dealt with, things will begin to move ahead quickly. The Knight of Air is decisive, quick, and confident. Your plans can now be implemented so make sure that you have carefully reviewed how you would like them to look and play out. Now is also a time to put your ego aside and ask yourself if you would be best served by seeking out the advice of a professional or someone that can guide you with the proper knowledge and confidence that is needed. It’s a sign of strength to ask for help when needed, and it will enable your plans to unfold seamlessly. This card denotes that your “knight in shining armor” may be entering the scene. For you this week, however, this is not the man rescuing the damsel in distress – this is a powerful ally that can help to support and empower you with respect to your career and projects. Success can come quickly if we allow it to happen! We assessed the situation, sought help, and now the Four of Fire shows us that by the end of the week, we are well on our way to the successful completion of our project. For some of us, we will see the fruits of our labor as early as the end of the week (remember that knight energy has things really moving along). For others, it may take a little longer, but rest assured that it is still in fact manifesting. 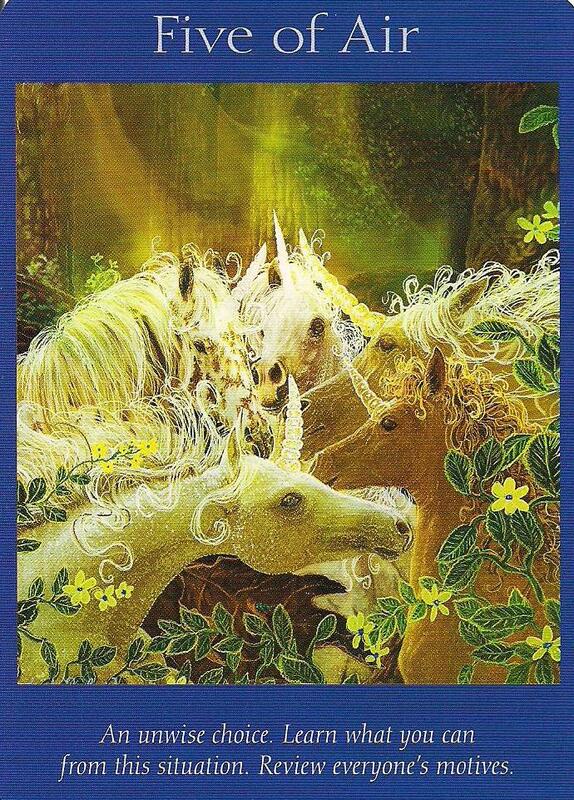 This card shows us that we can and are experiencing a lovely sense of abundance. We feel at peace as our project is coming to life in a way that is in complete alignment with our path and our purpose. We feel contented with ourselves, which brings about a sense of happiness within our lives and our homes. 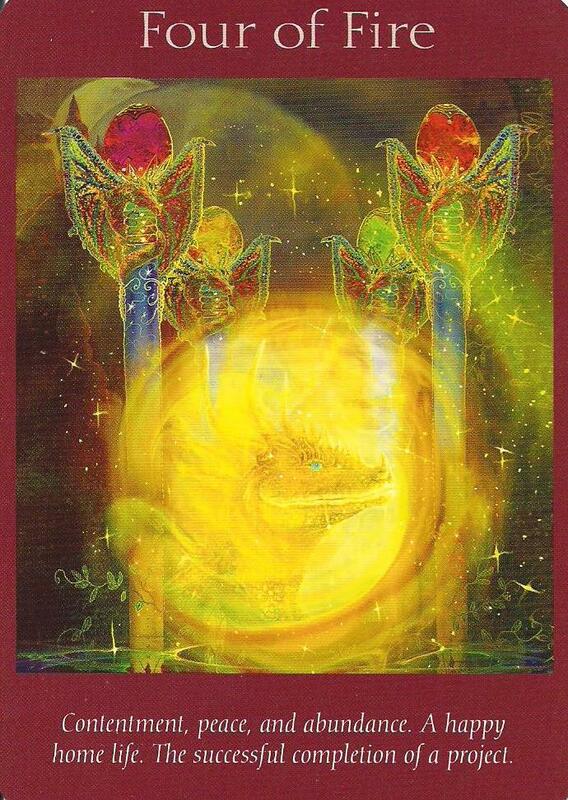 The dragon in the center of this card and the ball of solar energy lets us know that we are fully in our power right now due to the fact that we have been courageous and true to ourselves. We are also protected, snug within the four staffs of fire and light. Four is the number that the angels use to let you know that they are with and around you, and it is apparent here that they are guarding you (as synchronicity would have it, I looked down just after I typed “four” and saw that I was at 544 words). Enjoy this time and allow yourself to feel nurtured and comfy over the weekend before you head off on your next charge! 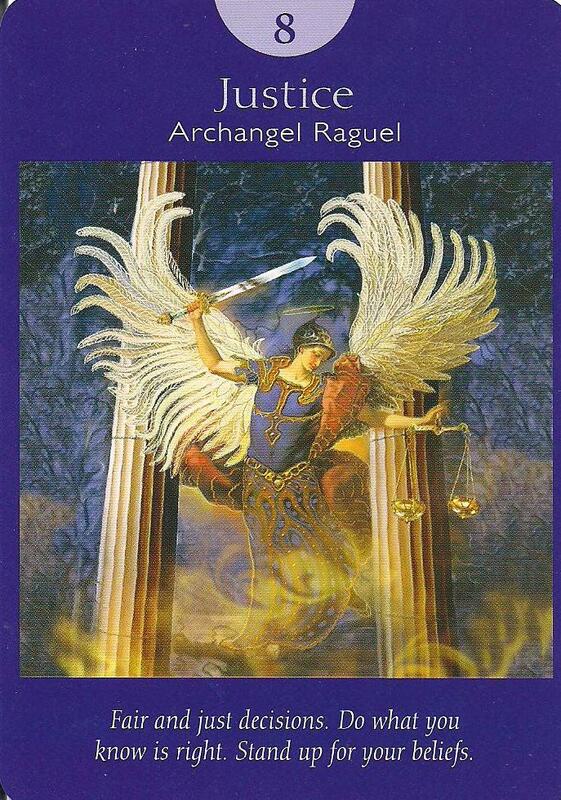 For this reading, I used The Angel Tarot by Doreen Virtue and Radleigh Valentine. 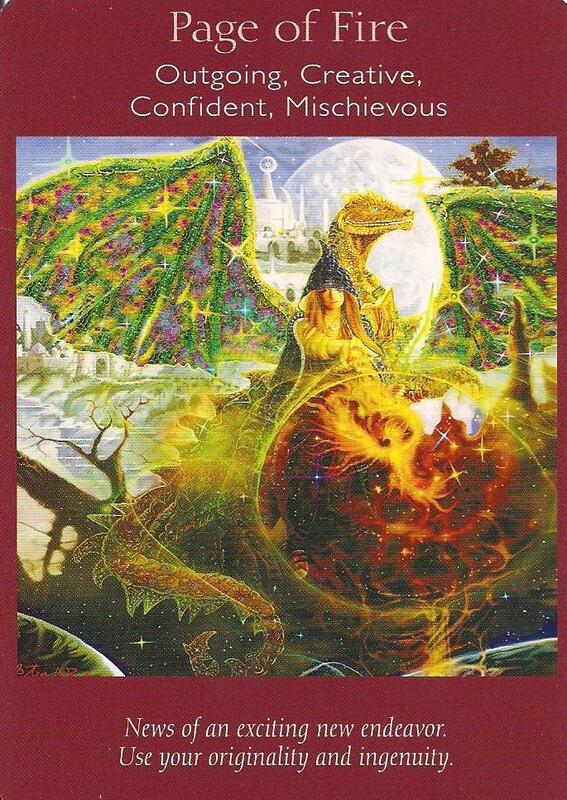 Categories: Uncategorized | Tags: Angel Tarot, Certified Angel Card Reader, Doreen Virtue, Five of Air Card, Four of Fire card, Knight of Air card, oracle card reading, Radleigh Valentine, weekly card reading | Permalink. 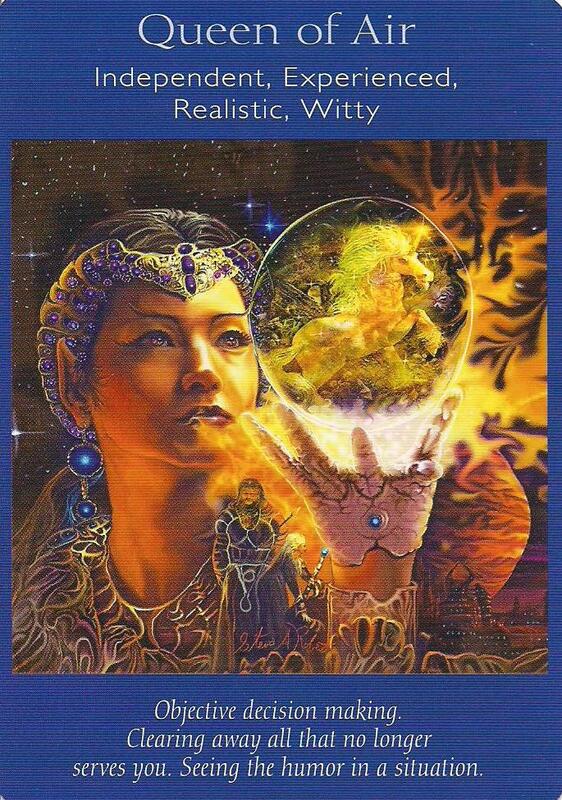 Weekly Card Reading: March 24-30 – Let Your Light Shine! We have a beautiful period of clearing and cleansing this week, which will allow us to let go and grow! The Release card jumped out of the deck as I was shuffling, with a huge sense of urgency I might add, and it set up the theme for the week. This is the end of a phase for you and now it’s time to move on. This forward movement is exactly that – forward! 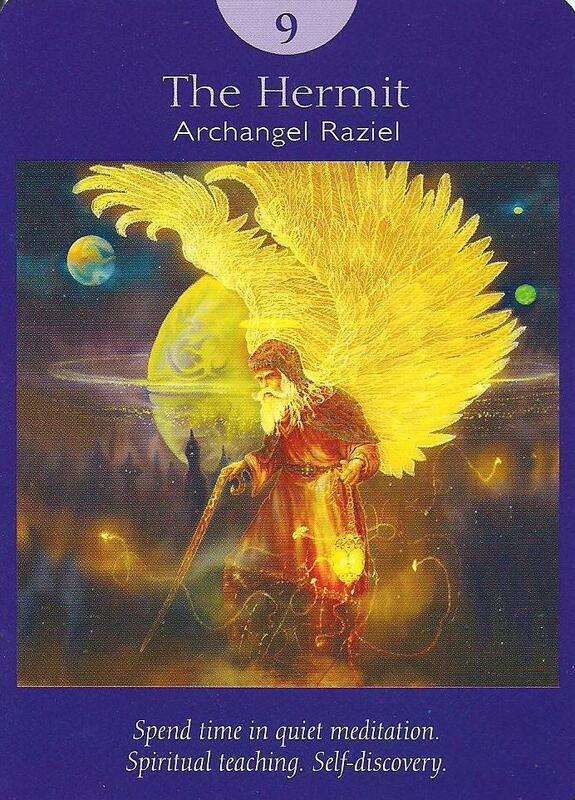 Archangel Azrael comes to help you to release any grief, anger, resentment, or fear that has been holding you back, for once you are able to do so, you can experience a profound shift that brings with it healing and levity. Notice the horses to the side of him. 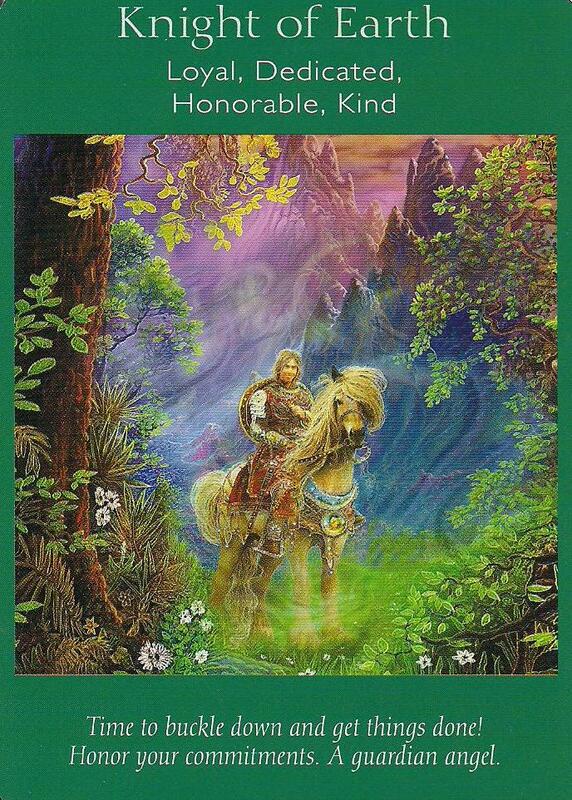 Horse energy represents freedom and the power of choice. Letting go is your choice. It can feel difficult to release our pain and suffering at times because despite the discomfort of them, it may be what we’ve become accustomed to feeling. 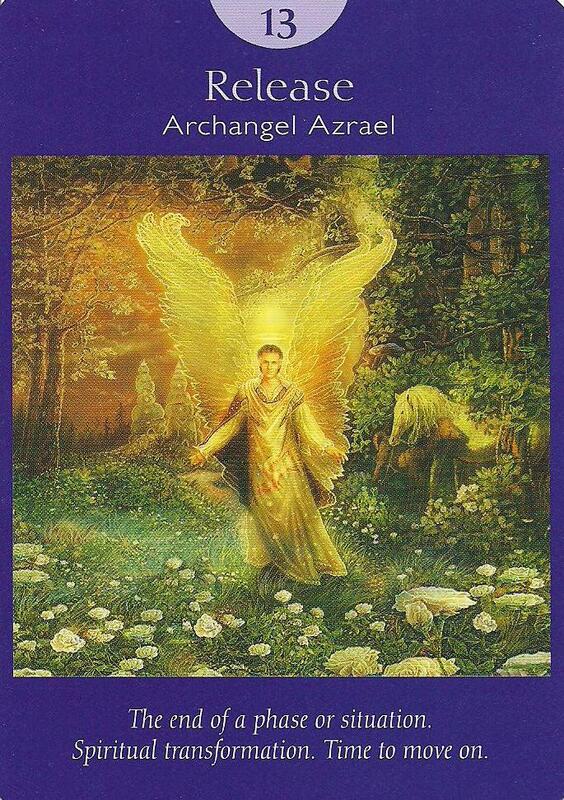 Know that allowing for this to be lifted and carried away to Spirit by Azrael can and will provide you with the seeds of transformation. The Queen of Air is a beautiful follow-up card. The Air suit is that of the intellect. We’ve allowed for an emotional and spiritual release and now it’s time to look at things logically. Channel the queen energy to do this. This woman is fierce, realistic, and experienced. She knows what she wants and how to get it. She is also aware that in order to continue along her path, it is necessary to cut free that which no longer serves you. Take time to determine if there is any loose end that you are resistant to letting go of so that you may address it and deal with it immediately. This is not an exercise of the heart. Get out a pad and paper and inventory yourself. Look at your patterns and what may still be hiding in a nook or cranny and bring it into the light and under your scrutiny. This is a time to be fully in your power. This is hard work and so the pay-off is high. 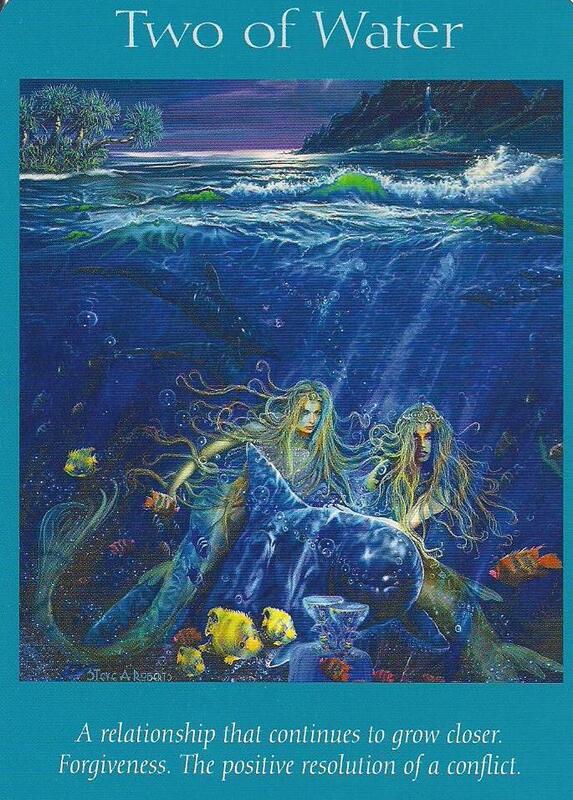 We end the week with the Two of Water card as we head back into the watery realm of the emotions. We’ve taken an intellectual broom to our dark corners and now we are ready to forgive if that is necessary or make amends if that is what is needed. Our candid self-appraisal and the willingness to take appropriate action allow for the positive resolution of conflicts and misunderstandings. Because of this our relationships with others are able to take on a new depth of meaning and we will enter into a period of heightened intuition and creativity. With every polishing of our rough edges, we can shine in a new light! Categories: Uncategorized | Tags: Angel cards, Angel Tarot, Archangel Azrael, Certified Angel Card Reader, Doreen Virtue, oracle card reading, Queen of Air card, Radleigh Valentine, Release card, Two of Water card, weekly card reading | Permalink.